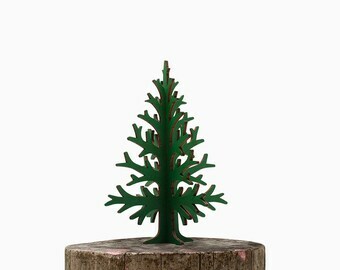 This is alternative christmas tree. 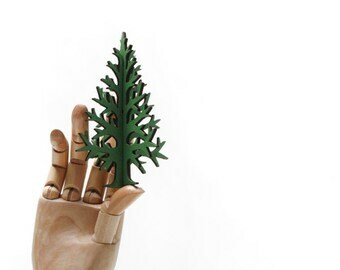 It is made of 100% natural recycled cardboard. 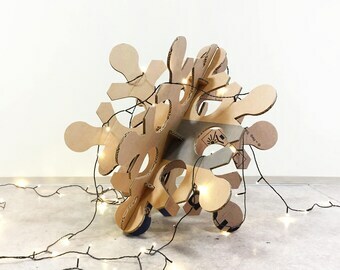 It's assembled with 5 (five) details and you can store it flat under the bed or whenever without using much space. 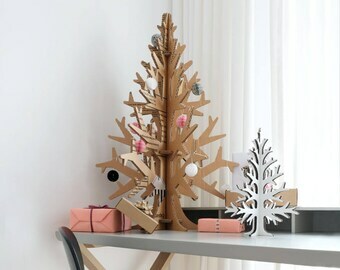 Put it back together next Christmas and have Scandinavian-like modern holiday decoration at home or in office! 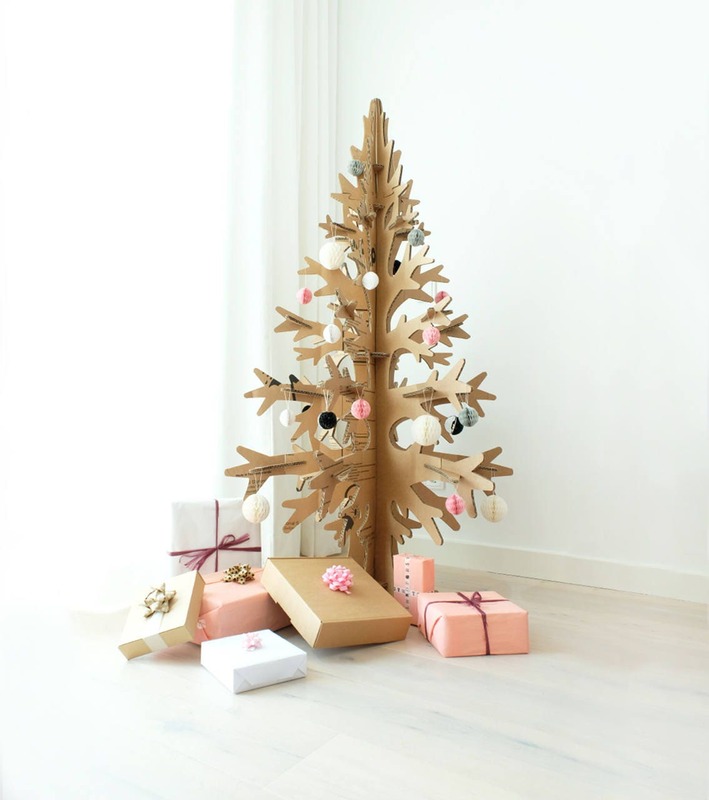 Decorate the tree as you wish with ornaments and / or paper balls. Add electric lighting to make it more beautiful and glowing in the dark. Don´t put it near open fire and/or candles. NB! 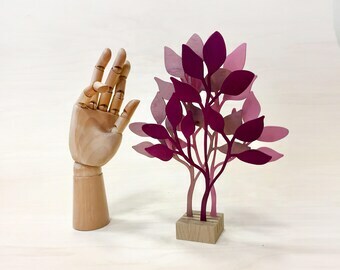 Trees are made from RECYCLED CARDBOARD. 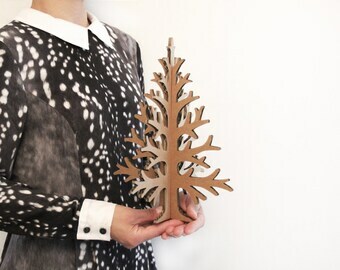 Recycled means that the details are cut out from pre-used cardboard boxes. Therefore there are fragments of texts and symbols printed on one side of the cardboard details. One detail of the tree may have fragment of white sticker with texts on it on one side. The material is very strong and sturdy. Please let me know if you want express shipping, I will calculate the cost for you. Beautiful tree! Easy assembled and nicely packaged! Will probably order again :) Thank you! Love this tree! It's the perfect size for our cozy space, and super easy to put together. It is beautifully cut and the little paper ornaments that came with it are adorable. Thank you for making our Christmas complete! I really hope you are happy with your order. If, for some reason you'd wish to return the purchase you can do so in 14 days after receipt of the goods. You will receive a refund for the item as soon as it makes it way back to me. The product must be in original condition. Please contact me for instructions before shipping the return. Customer happiness is very important to me. If there is a problem with the order, please let me know and we sure will find a solution. But if you are happy with what you get, let everybody know! Worldwide (US, Canada, Australia, Asia etc. ): 14-18 business days. Please note that in pre-christmas time (from mid November) the delivery can take even more time. So make your order early to have it in time! Most orders are shipped via Registered Mail. I will send you a tracking number after the package has been sent out. Please note that packages are trackable after they have reached the destination country. Your purchase will be shipped within one week. Assembling guide is included in the package. Please note that some custom request orders (for example oversized items) can take a bit longer to arrive. Additional delays can also be caused by customs declaration. The buyer is responsible for any duties and customs charges that may be incurred. 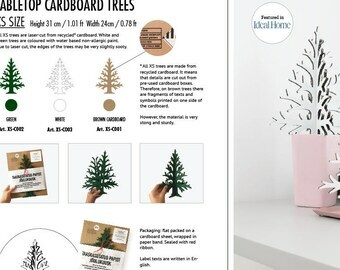 “RECYCLED cardboard” means that the details of the trees are literally cut out from pre-used cardboard containers. You can see the fragments of printed texts and/or sticker on details of the tree. Please take it as a quaintness and a sign from a long life that the material has lived before. Or just take it as a canvas for your own creation and decorate, draw or paint your tree as you wish. If you need gift wrapping, just let me know! If you have any questions on enquiries, please don't hesitate to contact me. I also accept wholesale orders. 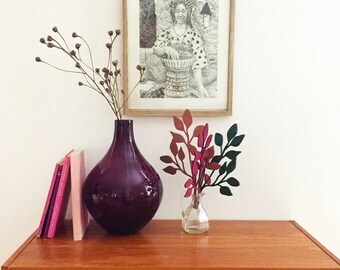 Wooden flowers, laser-cut flowers, set of three. Mothers day gift. 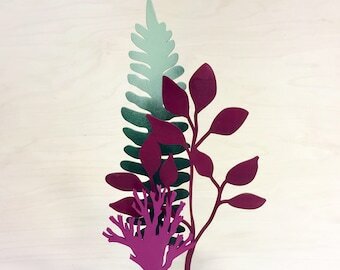 Blushful Blueberry Bush, Ombre Fern and Mysterious Moss. Wooden flowers, flower arrangement, Mothers day gift, set of three. 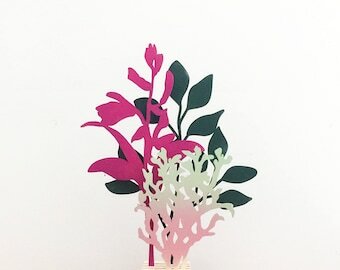 Deep Green Blueberry Bush, Pink Hyacinth Orchid, Ombre Moss.